The English artist, Paul Sandby, (1725 – 1809) was the first to really focus attention on North Wales. In 1771, he was employed by Sir Watkin Williams Wynne to accompany him on a sketching tour of North Wales – a bit like we would take a camera with us today. The resulting pictures were published in book of prints; and as the industrial revolution gathered pace, such books of rural scenery became increasingly popular. In 1757, the poet, Thomas Grey published the work, ‘The Last Bard’. Based on a story of Edward 1’s reputed massacre of Welsh bards, and the dramatic suicide of the last survivor, it was hugely popular and inspired a number of paintings of the subject over the next 50 years. From the mid 1770s, North Wales rapidly became one of the most popular of British destinations in which to tour and paint. The French Revolution (1789-99) and the Napoleonic wars (1799-1815) made travel abroad dangerous, and this encouraged artists to turn to native subjects. 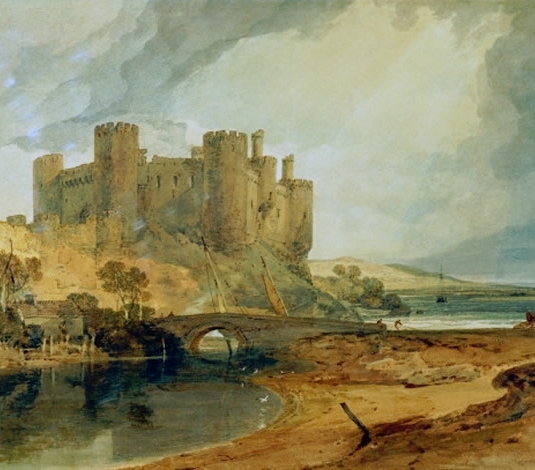 Paintings accentuating the wildness and romanticism of Wales became the domestic versions of classical paintings made by artists on the Grand Tour. 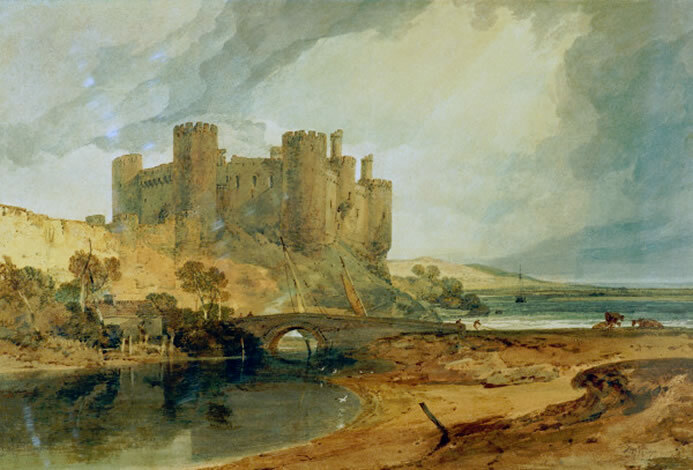 Famous artists, John Sell Cotman (1782 – 1842), J. M. W. Turner (1775 -1851), Thomas Girtin (1775 – 1802) and John Varley (1778 – 1842) all made visits to North Wales, and their patron Sir George Beaumont used to lease a house up the Conwy Valley in which he would entertain literary and artist guests. Through the mid 19th century, road improvements and the building of the railway further opened access to artists and tourists alike. Between 1844 and 1856, the famous watercolourist, David Cox, (1783 – 1859) who studied under Varley, spent time working in North Wales, based in Betws-y-Coed, which became attractive to a number of artist visitors who formed an artists’ colony there. Eventually, in 1881, a group of artists who were based in, or regular visitors to the Conwy area formed the Royal Cambrian Academy. They obtained permission from the Mostyn Estates (the then owners) to hold their exhibitions in Plas Mawr, Conwy. By 1890, the art gallery had been built in Gloddaeth Street, and the recently established town was regarded as a ready market for paintings of the area.